STILL, we thought we would drop down there a minute, but on anothererrand. Most of the professor's cargo of food was put up in cans, in thenew way that somebody had just invented; the rest was fresh. When youfetch Missouri beefsteak to the Great Sahara, you want to be particularand stay up in the coolish weather. So we reckoned we would drop downinto the lion market and see how we could make out there. 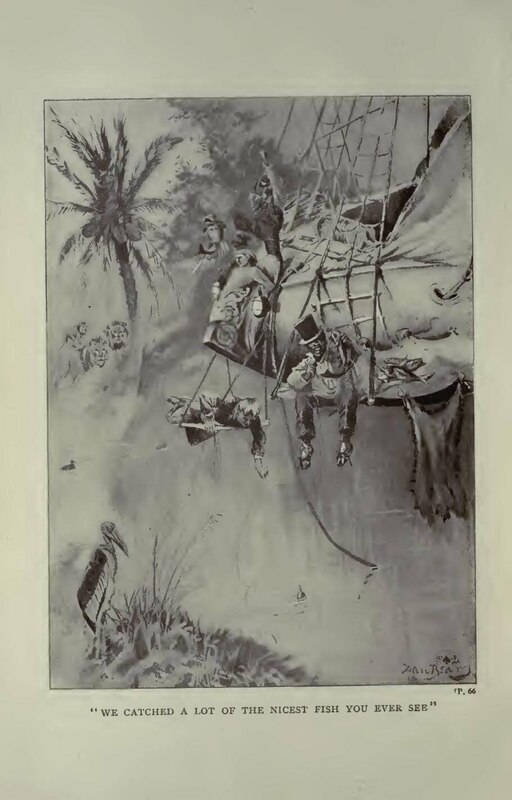 We hauled in the ladder and dropped down till we was just above the reachof the animals, then we let down a rope with a slip-knot in it and hauledup a dead lion, a small tender one, then yanked up a cub tiger. We had tokeep the congregation off with the revolver, or they would 'a' took ahand in the proceedings and helped. We carved off a supply from both, and saved the skins, and hove the restoverboard. Then we baited some of the professor's hooks with the freshmeat and went a-fishing. We stood over the lake just a convenientdistance above the water, and catched a lot of the nicest fish you eversee. It was a most amazing good supper we had; lion steak, tiger steak,fried fish, and hot corn-pone. I don't want nothing better than that. We had some fruit to finish off with. We got it out of the top of amonstrous tall tree. It was a very slim tree that hadn't a branch on itfrom the bottom plumb to the top, and there it bursted out like afeather-duster. It was a pa'm-tree, of course; anybody knows a pa'm-treethe minute he see it, by the pictures. We went for cocoanuts in this one,but there warn't none. There was only big loose bunches of things likeoversized grapes, and Tom allowed they was dates, because he said theyanswered the description in the Arabian Nights and the other books. Ofcourse they mightn't be, and they might be poison; so we had to wait aspell, and watch and see if the birds et them. They done it; so we doneit, too, and they was most amazing good. By this time monstrous big birds begun to come and settle on the deadanimals. They was plucky creturs; they would tackle one end of a lionthat was being gnawed at the other end by another lion. If the lion drovethe bird away, it didn't do no good; he was back again the minute thelion was busy. The big birds come out of every part of the sky--you could make them outwith the glass while they was still so far away you couldn't see themwith your naked eye. Tom said the birds didn't find out the meat wasthere by the smell; they had to find it out by seeing it. Oh, but ain'tthat an eye for you! Tom said at the distance of five mile a patch ofdead lions couldn't look any bigger than a person's finger-nail, and hecouldn't imagine how the birds could notice such a little thing so faroff. It was strange and unnatural to see lion eat lion, and we thought maybethey warn't kin. But Jim said that didn't make no difference. He said ahog was fond of her own children, and so was a spider, and he reckonedmaybe a lion was pretty near as unprincipled though maybe not quite. Hethought likely a lion wouldn't eat his own father, if he knowed which washim, but reckoned he would eat his brother-in-law if he was uncommonhungry, and eat his mother-in-law any time. But RECKONING don't settlenothing. You can reckon till the cows come home, but that don't fetch youto no decision. So we give it up and let it drop. Generly it was very still in the Desert nights, but this time there wasmusic. A lot of other animals come to dinner; sneaking yelpers that Tomallowed was jackals, and roached-backed ones that he said was hyenas; andall the whole biling of them kept up a racket all the time. They made apicture in the moonlight that was more different than any picture I eversee. We had a line out and made fast to the top of a tree, and didn'tstand no watch, but all turned in and slept; but I was up two or threetimes to look down at the animals and hear the music. It was like havinga front seat at a menagerie for nothing, which I hadn't ever had before,and so it seemed foolish to sleep and not make the most of it; I mightn'tever have such a chance again. We went a-fishing again in the early dawn, and then lazied around all dayin the deep shade on an island, taking turn about to watch and see thatnone of the animals come a-snooping around there after erronorts fordinner. We was going to leave the next day, but couldn't, it was toolovely. The day after, when we rose up toward the sky and sailed off eastward, welooked back and watched that place till it warn't nothing but just aspeck in the Desert, and I tell you it was like saying good-bye to afriend that you ain't ever going to see any more. "Well, hit stan' to reason we is. You knows how long we's been a-skimmin'over it. Mus' be mos' out o' san'. Hit's a wonder to me dat it's hilt outas long as it has." "Oh, I ain't a-worryin', Mars Tom, only wonderin', dat's all. De Lord'sgot plenty san', I ain't doubtin' dat; but nemmine, He ain't gwyne toWAS'E it jist on dat account; en I allows dat dis Desert's plenty bigenough now, jist de way she is, en you can't spread her out no mo' 'doutwas'in' san'." "Oh, go 'long! we ain't much more than fairly STARTED across this Desertyet. The United States is a pretty big country, ain't it? Ain't it,Huck?" "Well," he says, "this Desert is about the shape of the United States,and if you was to lay it down on top of the United States, it would coverthe land of the free out of sight like a blanket. There'd be a littlecorner sticking out, up at Maine and away up northwest, and Floridasticking out like a turtle's tail, and that's all. We've took Californiaaway from the Mexicans two or three years ago, so that part of thePacific coast is ours now, and if you laid the Great Sahara down with heredge on the Pacific, she would cover the United States and stick out pastNew York six hundred miles into the Atlantic ocean." "Yes, and they're right here, and I've been studying them. You can lookfor yourself. From New York to the Pacific is 2,600 miles. From one endof the Great Desert to the other is 3,200. The United States contains3,600,000 square miles, the Desert contains 4,162,000. With the Desert'sbulk you could cover up every last inch of the United States, and inunder where the edges projected out, you could tuck England, Scotland,Ireland, France, Denmark, and all Germany. Yes, sir, you could hide thehome of the brave and all of them countries clean out of sight under theGreat Sahara, and you would still have 2,000 square miles of sand left." "Well," I says, "it clean beats me. Why, Tom, it shows that the Lord tookas much pains makin' this Desert as makin' the United States and all themother countries." Jim says: "Huck, dat don' stan' to reason. I reckon dis Desert wa'n'tmade at all. Now you take en look at it like dis--you look at it, and seeef I's right. What's a desert good for? 'Taint good for nuthin'. Deyain't no way to make it pay. Hain't dat so, Huck?" "Mars Tom, I b'lieve it uz jes like when you's buildin' a house; dey'sallays a lot o' truck en rubbish lef' over. What does you do wid it?Doan' you take en k'yart it off en dump it into a ole vacant back lot?'Course. Now, den, it's my opinion hit was jes like dat--dat de GreatSahara warn't made at all, she jes HAPPEN'." "There's another trouble about theories: there's always a hole in themsomewheres, sure, if you look close enough. It's just so with this one ofJim's. Look what billions and billions of stars there is. How does itcome that there was just exactly enough star-stuff, and none left over?How does it come there ain't no sand-pile up there?" "What's de Milky Way?--dat's what I want to know. What's de Milky Way?Answer me dat!" In my opinion it was just a sockdologer. It's only an opinion, it's onlyMY opinion and others may think different; but I said it then and I standto it now--it was a sockdologer. And moreover, besides, it landed TomSawyer. He couldn't say a word. He had that stunned look of a personthat's been shot in the back with a kag of nails. All he said was, as forpeople like me and Jim, he'd just as soon have intellectual intercoursewith a catfish. But anybody can say that--and I notice they always do,when somebody has fetched them a lifter. Tom Sawyer was tired of that endof the subject. "Why, I've heard talk about this Desert plenty of times, but I neverknowed before how important she was." "Important! Sahara important! That's just the way with some people. If athing's big, it's important. That's all the sense they've got. All theycan see is SIZE. Why, look at England. It's the most important country inthe world; and yet you could put it in China's vest-pocket; and not onlythat, but you'd have the dickens's own time to find it again the nexttime you wanted it. And look at Russia. It spreads all around andeverywhere, and yet ain't no more important in this world than RhodeIsland is, and hasn't got half as much in it that's worth saving." "That's it--it's the one I've been looking for, sure. If I'm right, it'sthe one the dervish took the man into and showed him all the treasures." So we begun to gaze, and he begun to tell about it out of the ArabianNights.